How To Connect Your Synthesizer To Your Computer? MIDI stands for Musical Instrument Digital Interface. It is a language enabling synthesizers and computers to exchange musical information. Thanks to this system, the computer can record the notes you play on your musical keyboard and take control of a musical synthesizer to play your scores and compositions. A Macintosh or a PC does not natively contain a MIDI connector. This adaptation is done using a Midi interface. On Macintosh, a Midi interface is a small external box. It comprises connectors necessary for Midi cables and it has a cable which can be connected on the back panel of the Macintosh (Modem or Printer port, or USB port). On PC, the more common Midi interface is a USB MIDI interface that connects to the USB port of the computer and have two or more MIDI cables to connect to your musical instrument. Midi devices have one or more Midi connectors. A Midi cable only allows a one way communication. If you have for example a Midi synthesizer with a keyboard, it must at least have 2 Midi connectors. The first should be labeled Midi In (Midi input) and enables the synthesizer to receive musical data from your computer. The second Midi connector should be labeled Midi Out (Midi output) and lets the synthesizer send the notes you play on the musical keyboard to the computer. A third Midi connector is often present, labeled Midi Thru. It is a Midi output sending a copy of the data coming from the Midi In connector of the instrument. It is a Midi echo which can be used to connect another Midi devices that needs to receive the same MIDI messages. When you connect Midi devices together, it is necessary to keep that information in mind. A connector is either an input (Midi In) or an output (Midi Out or Midi Thru). 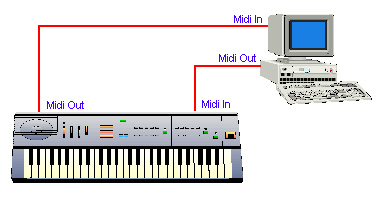 A Midi cable must ALWAYS be connected between an output of a device and the input of another device. Any other combination will not work. Here are diagrams of most current connection setups between a MIDI device and a computer. To install your Midi interface correctly, read the installation manual. Also take care to install the driver software of the interface (MIDI and sound card drivers for Windows). This installation should normally be explained in the MIDI interface user manual. More and more, the interfaces are Plug & Play, which means that there is no specific action needed to install the driver. A Midi cable does not transport sounds but only information concerning the notes which are played on the keyboard as well as other information used to configure a synthesizer. The connections explained above relate only to the Midi aspect. If your synthesizer does not have an internal speaker, you need to connect its audio output to an amplification system connected to loudspeakers, such as a Hi-Fi system. If you have a sound card, its audio output must be connected either to an external loudspeaker provided with the card or to your Hi-Fi system. Consult your card or synthesizer manual. An important remark applies if you have a MIDI cable for a sound card (Windows). On one side, it is a large plug adapted to a sound card connector, also called Joystick port (sometimes this cable has a similar "female" domino plug, enabling the connection of a joystick at the same time). Two MIDI connectors can be found on the other side of this cable. One is called MIDI IN and the other MIDI OUT. These names correspond respectively to the MIDI input and the MIDI output of the computer. Considering the preceding diagrams, it is thus necessary to connect the MIDI IN plug into the MIDI OUT connector of the synthesizer and vice versa. The inversion of this connection is a very frequent cause of MIDI failure. To connect it wrong fortunately does not destroy anything, but MIDI communication is not established. For additional information, refer to the Pizzicato manual!